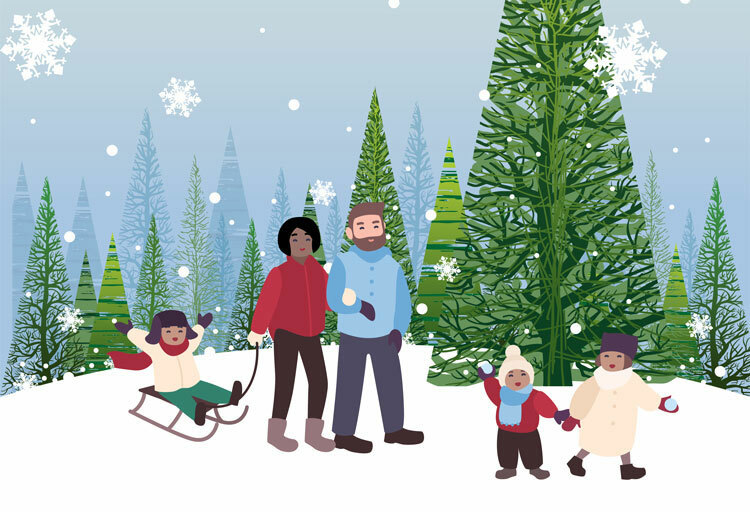 The Tree in the Forest - Family Times is an award-winning magazine with staff-written news, feature stories and artwork that inform and inspire Central New York parents and their children. Of all the traditions a parent could follow while raising children, getting the annual Christmas tree is probably one of the most memorable. No two seasons are ever exactly the same, and the stages the kids go through change significantly from year to year. Over the 20 years my husband, Steve, and I have been parents, we’ve seen it all. For the first few years it was easier to get a pre-cut tree from a lot. Our girls were too little to appreciate a trip into the woods, and it was too hard to drag a tree while holding a baby. By the time our second child was a toddler, our tradition was born. We had decided to make a day of it with my mother-in-law and father-in-law and had a lot of fun. Eventually my brother and sister-in-law joined us. Today, our crew is now complete: me, my husband, and our four kids; my parents-in-law; and my brother and sister-in-law, and their two children. We went to a few different tree farms, but in recent years have found ourselves at Granger’s Christmas Tree Farm in Mexico. Granger’s is a family business, and it’s nice being recognized each year with remarks about how fast the kids are growing. changing event. Back in 2004, we tried to wait out the snowless weather. The entry in my journal on Dec. 12 complained if we waited any longer it would be Christmas. The day turned out to be rain-free without any lines. Generally, I like to stay at places at least as long as the time it takes to arrive there. So, with about a half-hour to get to Granger’s, I felt we should at least make an effort to walk through the fields. My father-in-law found his tree two rows in and began sawing away. The hubby immediately got excited, but no. I encouraged him to keep searching to get more out of the experience. The tree we found was perfect and full. Each year I name our trees and that one was Majestic. Unfortunately, a 150-pound tree is very difficult to drag without snow to glide on, especially since it hung over the plastic sled. And it felt like a quarter-mile from civilization. It was covered in mud by the time we made it back to the barn to pay. Then, once we were home, we had to prop it up and get out the hose to clean the thing off. Soaking wet, the tree weighed even more and was impossible to shake dry, especially since it had begun to rain. So, the tree froze again while we waited for it to stop dripping. We were also new to estimating size. It may have looked modest while outside among other trees, but once we finally got it indoors we realized either our house was incredibly short, or the tree was impossibly tall. Too late, we discovered Majestic was a nine-foot monster as it left a huge mark across the stucco finish when we pulled it upright on the short end of the cathedral ceiling to the high end. After it was anchored in, it thawed and relaxed, growing wider and wider. It just barely fit in its designated area near the doorway. That was the season we had problems maneuvering each time we went in and out of the house. A ladder was necessary to add the angel, and the mark on the ceiling was a constant reminder of that Christmas adventure for more than two decades. Then there was the year my husband was on the floor with the baby, Danielle, during tummy time when a huge, black spider awoke in the warm heat of the house and made its way across the floor next to him. Stomach to sprinting in two seconds flat! For the longest time I worked every other weekend, so the month of December was limited for holiday traditions. Mother Nature usually had different ideas for those dates. We’ve been on open wagon rides in minus-10-degree weather, bundled up so only our eyes were exposed, looking a lot like Ralphie’s little brother, Randy, from A Christmas Story. Some years had two feet of fresh snow we thought we’d lose the kids in. (I think winter hats with red flags on top would really sell in those conditions.) A few mild winters have had us out only in thick sweaters, posing for pictures as if we were advertising for L.L. Bean. Trimming the tree has had its challenges along the way. It only takes one time to realize grooming the branches will result in oozing sap where they’ve been cut, so now I only wear old clothes. We also make sure the tree stand is the appropriate size, and bungee cord our tree so it won’t fall. Again. My biggest challenge used to be allowing the kids to decorate the tree, or more accurately, the same branch. This was done until it was weighed down with silver and gold, crying uncle. I’m particular about spacing and, well, children aren’t. To be fair, they are only so tall. I give a lot of credit to my mother, who appreciates precision, too. I remember when my brother and I were little and would run to her to be given the next bulb or ribbon to be hung. If she “adjusted” them later, I never caught on. Anyway, I’m much better these days, knowing how quickly the years turn toddlers into teens. Everyone can marvel over the fresh pine smell and perfect needles (this includes the cats, who believe tree water is feline Evian), and comment on the homemade ornaments from Years Past that will always adorn our family evergreen. No matter the weather, we’ve strengthened our family as we’ve laughed in the fresh air, searched and found the perfect tree, and made lasting memories. Laura Livingston Snyder is a writer and mother of four who lives north of Syracuse. She blogs at freshapplesnyder.com.